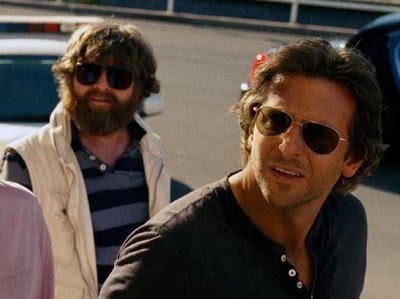 The Hangover was one of the big suprise hits of 2009; a shock filled R-rated comedy with an incoherent yet likeable plot that had an instantly relatable ethos to anyone who had woken up after an alcohol fueled night of regret. A more divisive sequel followed in 2011 and now with the release of The Hangover: Part III the franchise is concluding. With that conclusion comes the expected resolution and reflection of its central characters. The main problem this presents is simply that the first film never had anything particularly meaningful to say, meaning director Todd Phillips and co-writer Craig Mazin have to inject some heavier ideas that attempt to widen its dramatic approach but stunt the films comedic potential in the process. The Hangover: Part III begins with an action set-piece that in many ways sets the tone for the rest of the movie. 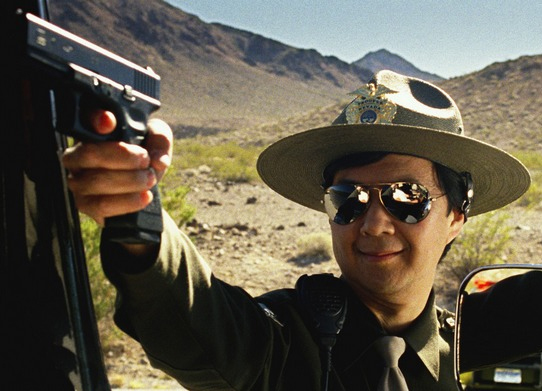 Chow (Ken Jeong), a minor character in the original, but now a featured protagonist, escapes from a Bangkok prison in the midst of a dangerous riot. It’s a well shot and adequately thrilling opening, but one that certainly doesn’t feel like the beginning of a comedy film. The proceeding plot then diverts from the norm of revolving around a central wedding, and rather instead focuses on Alan’s (Zach Galifianakis) descending mental state and Chow’s escape from prison that coincide to send the Wolfpack on another adventure. John Goodman is introduced to the fray as villain Marshall who serves as little more than a cliched voice box to explain the tenous link the plot has to the original film. It seems that when Alan bought the drugs that triggered the events of the original film, he inadvertantly cost Marshall a share of gold that was stolen by Chow and that he now wishes to re-claim. Due to their percieved closeness to Chow, Marshall tasks the trio with finding Chow and capturing him. It’s a puzzling explanation that seems more at home in a heist movie than a comedy and also sets in motion an unfortunately very predictatble series of events. And so the gang chase Chow, he alludes them, they chase again on repeat until a conclusion steers things back to Alan for a more reflective finale. The problem is director Todd Phillips plays each moment with sincerity but also a fickle sense of levity that generally undermines each attempt at genuine drama while also remaining too rigid for humour to develop. For instance, a shot of Chow ascending stairs (in slow-motion) only to don some shades is a moment, which if exaggerated appropriately could have been suitably humourous but instead plays hinting at a yearning for The Hangover: Part III to be a more substantial piece of drama than it perhaps needs to be. Some of the grading and shot selection is well thought out and stylized but again doesnt lend itself to comedy and instead brings shade of gangster movies or thrillers. The Hangover: Part III comes across like the product of an absent minded student sketching phallus drawings in his Maths textbook - it seems unfocused and tonally opposite as to what is expected of the series. The wolfpack trio consisting of Alan, Phil and Stu (Doug is once again strangely removed for the majority of the film) labour forward with suprising anguish like they are growing weary of the being in these situations so often, a pall that threatens to rub off on the audience. 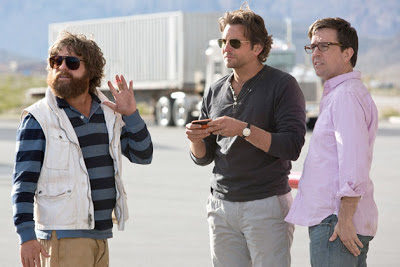 Phil (Bradley Cooper) and Stu (Ed Helms) even seem tired of Alan’s antics, despite the character once again played enthusaistically by Zach Galifianakis who is the series’ chief source of humour. The early (and quickly abondoned) premise of getting Alan help for what is revealed to be a serious mental condition seems too heavy yet ephemeral in application, and exposes the series inability to tackle serious subject matter. This also impacts on the character and performance as a whole - Galifianakis carries so much of the burden of delivering the laughs here that his mental state has to be examined becuase of the writers caricaturing him to the point of exhaustion. 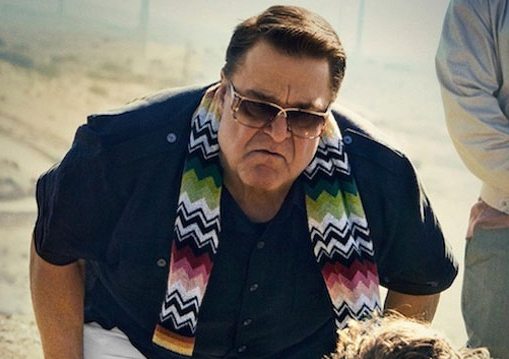 Chow’s growing role as a prominent character in the series seems to be about alieviating the responsibitlies of Galifianakis with his own quips and set-pieces that try desperately to bring the films tone back to something approaching comedy. The problem is that fleeting quips are all that the actors can offer when the seriousness of the plot and its set-pieces allow little in the way of comedic value or growth. To critizise on a more base level, The Hangover: Part III involves no hangover. The characters are sober, giving a linearity to the plot which makes its twists and turns more predictable and overall energy less chaotic. The original movie had a free fall plot that felt swept up in its own momentum; it cleverly mirrored the incoherent voyage of discovery on a morning after the night before. The plot in The Hangover: Part III is explained by the villain before the 30 minute mark, and really any fun or mystery is spoiled. Sure there are a handful of twists and turns offered throughout but the film never surprises you in the way the original, and any great comedy, should at least attempt. The Hangover: Part III is not without some merit. If you are seeking more resolution than the previous films have offered then it does sign off in trademark fashion including a credits sequence that shocks more than the previous 95 minutes combined. There are laughs - albeit small - to be had, but if you expect it to offer something new or surprising or on par with its terrific original instalment then it is likely to be more on par with an actual hangover and a sobering experience indeed. Press access for this screening of The Hangover: Part III was provided by Substance PR. (A)musings Media gratefully acknowledges their generous invitation. Good review. As far as being a comedy, yes, this movie as labeled as a comedy, but the laughs in this movie are pretty rare to some by. Actually, they rarely even come around.